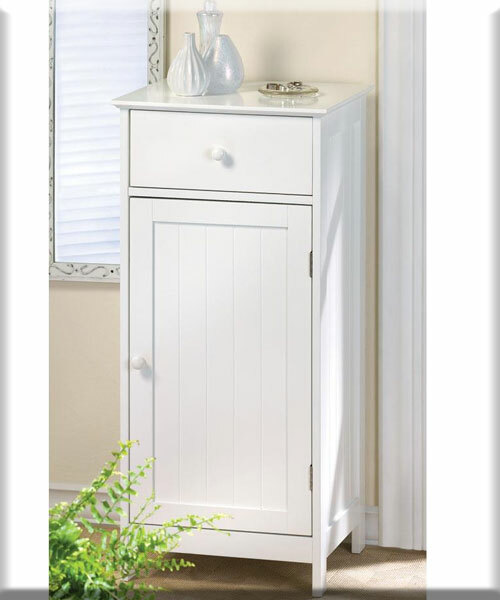 Stock# - 15128 Lakeside Tall Storage Cabinet - Here s the perfect solution to your storage problems! 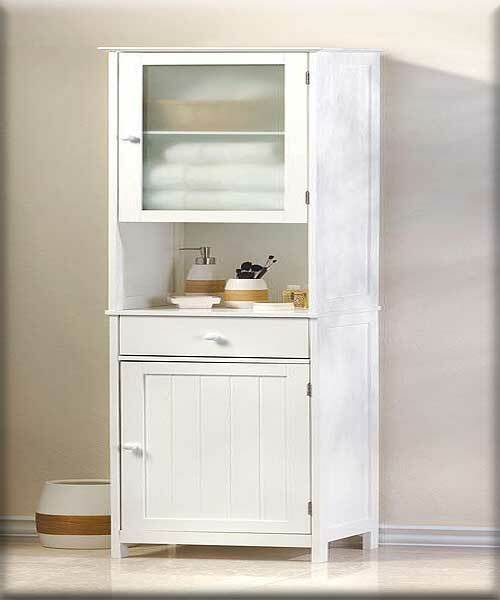 This tall cabinet doesn t take up much space and fits perfectly in narrow bathrooms, hallways, kitchens, and beyond. With two doors, a drawer, and an open shelf, you can store, display and organize quickly and easily! 14 5/8" x 13�" x 70 7/8" high. MDF wood with lacquer. 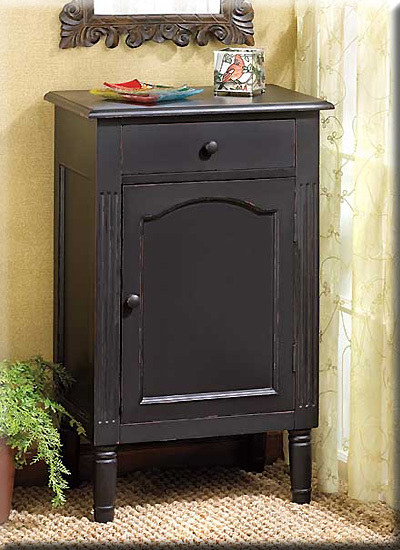 Stock# - 39092 Antiqued Black Wood Cabinet - This charming hand-painted cabinet has so many uses - an appealing end table next to sofa, beside the bed as a handy nightstand, or an attractive catchall cabinet for a home office or bath! Attractively weathered matte-black finish and a simple shape allow this winsome furnishing to blend in with most any decor. Features one drawer above a generous single-door storage space. Some assembly required. MDF wood. May require additional freight charge. 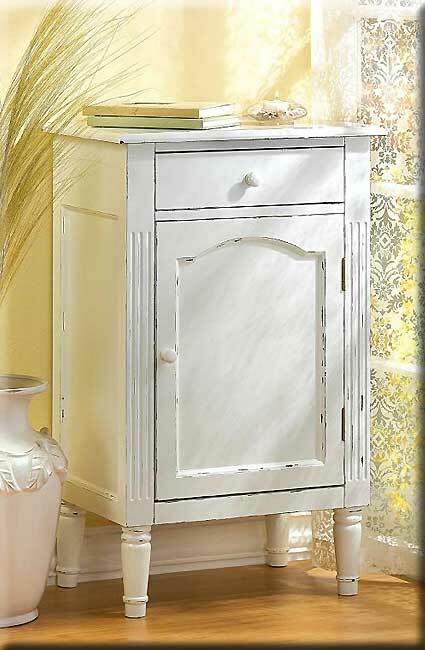 Stock# - 39093 Graceful Antique Style Cabinet - Simple lines and a creamy hand-distressed finish give this wonderful wooden cabinet the heirloom look of cherished vintage furnishings! 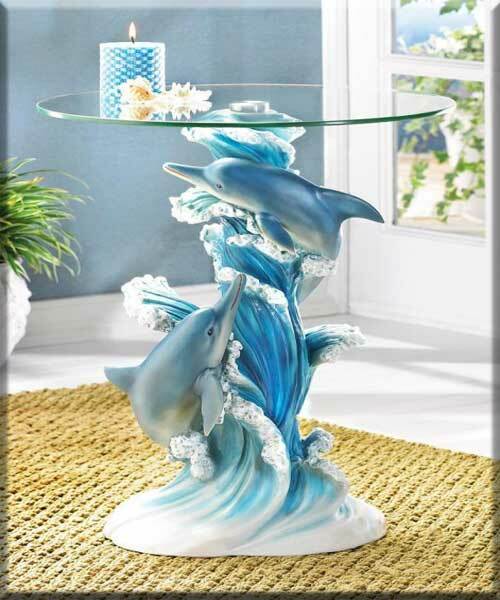 Makes an elegant bedside night stand; a handsome cabinet for any bath, or use your imagination to add stylish storage most anywhere in your home! MDF wood. Some assembly required. 18" x 12 1/2" x 29" high. Stock# - 15129 Lakeside Storage Cabinet - Who couldn t use one more drawer and shelf? The Lakeside Storage Cabinet is a handsome and hassle-free way to up your home s storage capabilities without giving up a lot of space. 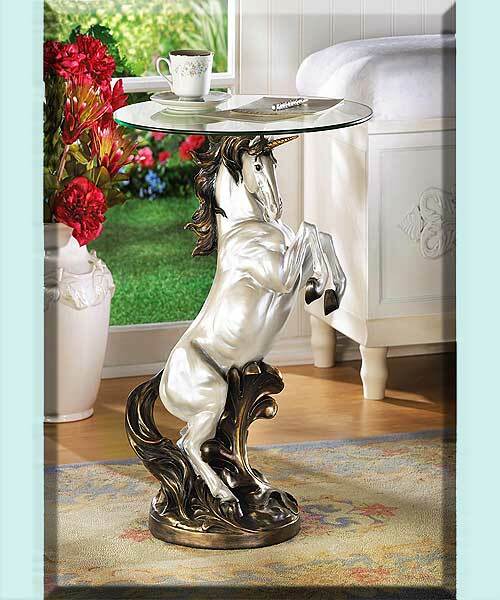 15 3/4" x 13 7/8" x 34 1/8" high. MDF wood with lacquer.